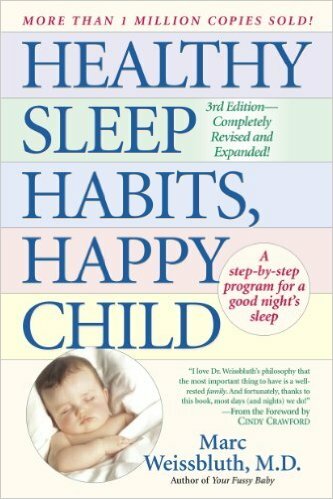 Healthy Sleep Habits, Happy Child (HSHHC) Book Review ~ My Baby Sleep Guide | Your sleep problems, solved! 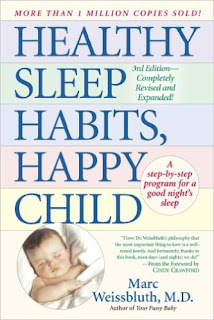 I highly recommend Healthy Sleep Habits, Happy Child, by Marc Weissbluth. I love the importance this book places on sleep and that it backs this up with research unlike many of the other books out there. 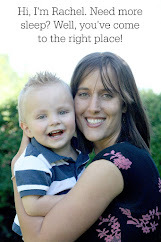 It emphasizes the importance of having your child on a schedule around 4 months. Personally, I think a flexible sleep routine is beneficial before this time, but that's just my opinion. Healthy Sleep Habits, Happy Child does suggests allowing your child to cry as long as necessary at night which I know some people will have a hard time with. BUT, it focuses on perfect timing, among other things, to prevent crying at sleep times (see Wake time) which is a great concept. This book also goes over sleep problems and solutions with older children too (night terrors, sleep walking, narcolepsy etc). Once again, I highly recommend this book. It can be a bit boring, I admit, but it is full of great information. What is the reasoning behind waiting till 4 months to get baby on a routine? Depends. Some people don't think you should ever do routine and instead should do whatever the child wants/needs because they know what is best for them and we shouldn't be guiding them in any way towards what works best for us and our family or what we think will work best for them (the baby whisperer specifically discusses this issue and says that we are their parents, we are here to direct them etc). Some people think that you should do whatever the child wants/needs until a certain age at which time they are will either fall into a routine themselves, will more easily adjust to a routine we form, will now benefit from a routine, that they are old enough to have some structure now (for various reasons they sometimes think you will be doing the child harm by having the routine earlier--often people think you will end up starving your child and neglecting them by a routine and that the baby knows best when they are a newborn). I can't remember the exact reasoning with hshhc. It was probably something like they will fall into a routine by themselves at a certain age and if they don't, you can easily help them do it because it is very beneficial for them at that age. Sorry this response is so muddled! does weissenbluth recommend not starting his extinction sleep training method until the baby is 6 months old? I am unclear on this from his perspective. I just got to your email on this and responded there. You should be fine at 5 months as long as your are ok with this. I have just found your blog, thank you for all of the information, its really helpful. I have a 9 week old who is sleeping well at night, after we finally get her to sleep, but we are still having issues with her day sleeps. She takes forever to get to sleep at times, and although we keep an eye on 'tired signs' and often act before she's too far gone, she spends so long fighting sleep that over tiredness is inevitable. what can you recommend, or do you have a suggestion on methods for settling during the day? We loosely follow the 4 S routine at night, and if I'm honest, i think the nights are easier because my husband puts her down! But we both struggle during the day. She is exclusively breastfed, a large baby, growing well. 9.5 weeks old. I'd do the 4 s routine for naps too if your aren't yet. Also take a glance at the wake time post to see if your near the averages. Try not to rush in too quickly and give her a moment to settle. When she starts to get very overtired I'd consider helping her a bit more to fall asleep so she doesn't get too overtired. Keep working at things. Time and practice makes a bit difference. Hi there - My daughter turned 2 in July, and since we used Weissbluth she has been sleeping like a champ since 6 months - asks to go to bed, wakes up singing, great napper. However, over the last several days things have changed significantly. She screams bloody murder when we put her down and today she is up at 5am. I'm listening to her cry as I type this. She has her favorite little blanket, pacifiers, we give her books... Things that used to work aren't any more. It's going to make us crazy! I know she is tired, and if we rock her she pretty much falls asleep in our arms. She went to bed religiously at 7pm, we pused it to 7:30/7:45 a couple of months ago. Do we need to go back to 7? We did last night and it didn't seem to help. We are going on vacation this weekend, to top it all off... We'll be in one large house with my in-laws, and I'm afraid she will be keeping everyone up... HELP! A lot of kids have issues at 2 years of age. They start to have issues that pop out of the blue that usually go away on their own (assuming you don't help them turn into habits). So I'd look over the usual stuff like illness and changes around her etc and once that is all done, keep doing things like you've done before offering minimal attention with wakings. My 2 year old actually started to do something like this at night around when he turned 2. I check him at first but eventually stopped checking completely and that improved things quickly. Consider moving bedtime a bit earlier to see if it helps, especially with those early morning wakeups. I like the helpful information you provide in your articles. I will bookmark your weblog and check again here frequently.